Many months ago as Rachel (the mind behind Smitten With Wovens) and I were hanging out, she pulled this Vena Cava Crema fabric sample out of a box and asked me what I thought of it. What did I think of it?! What the heck WAS this? It was like someone bred an ace bandage and some cotton balls or something. And it hadn’t even been washed yet! Fast forward to earlier this week when a Vena Cava Crema Ring Sling arrived on my doorstep to review. I could not contain my excitement. This has been “the year of the natty”, and Crema is such a wonderful addition to it. It has the trademark Cartoon Hearts that Smitten has become known for, but because of the natty colorway – the pattern is very subtle. It is hard to even see it from afar. The thing that makes Crema so very unique, is the stretch and moldability of the fabric. I have often used the word “ace bandage” to describe some of the positive attributes of wraps that have had that stretchiness that really conforms to the shape of the wearee and wearer. This blows them all out of the water. It almost feels like it has some elastic in it – though it is 100% cotton Jacquard. It makes for such a cushy and comfy fit, no matter the size of your baby. 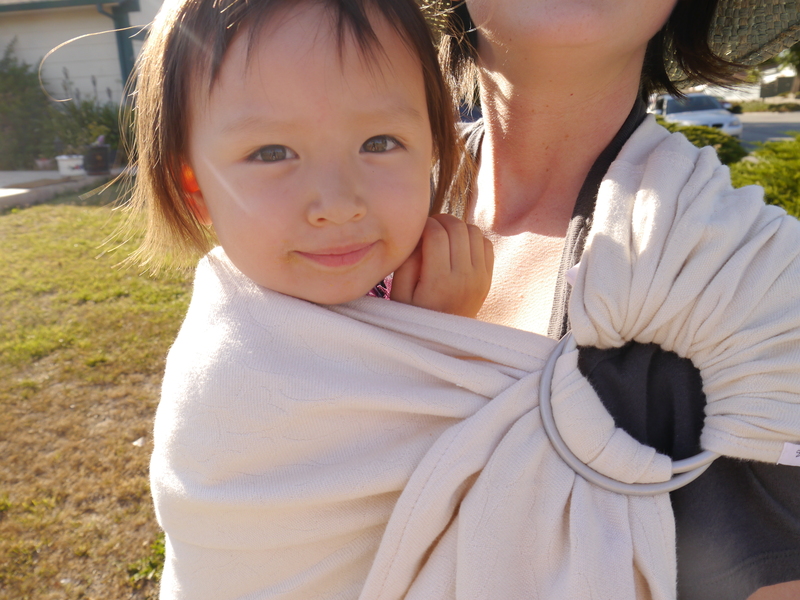 I first had the opportunity to try out the Crema Ring Sling with my friends’ tiny 2 month old girl. It was amazing. It wrapped around her like a warm hug, holding her perfectly in place with its smooshiness. 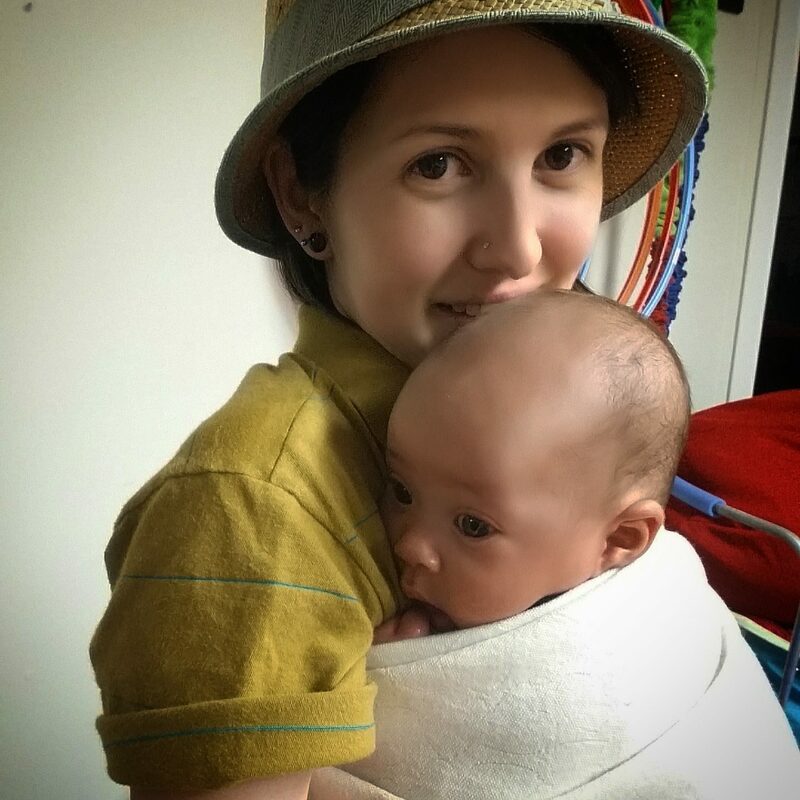 It is a medium thick wrap, weighing in at 260 g/m2, so I was a little concerned it would be a lot of fabric for such a little baby – but that did not prove to be the case. Because it was so soft and stretchy, it made for the perfect texture for an infant wrappee. She felt completely weightless. Baby girl was asleep in just a few minutes, so I am sure she was comfortable too. 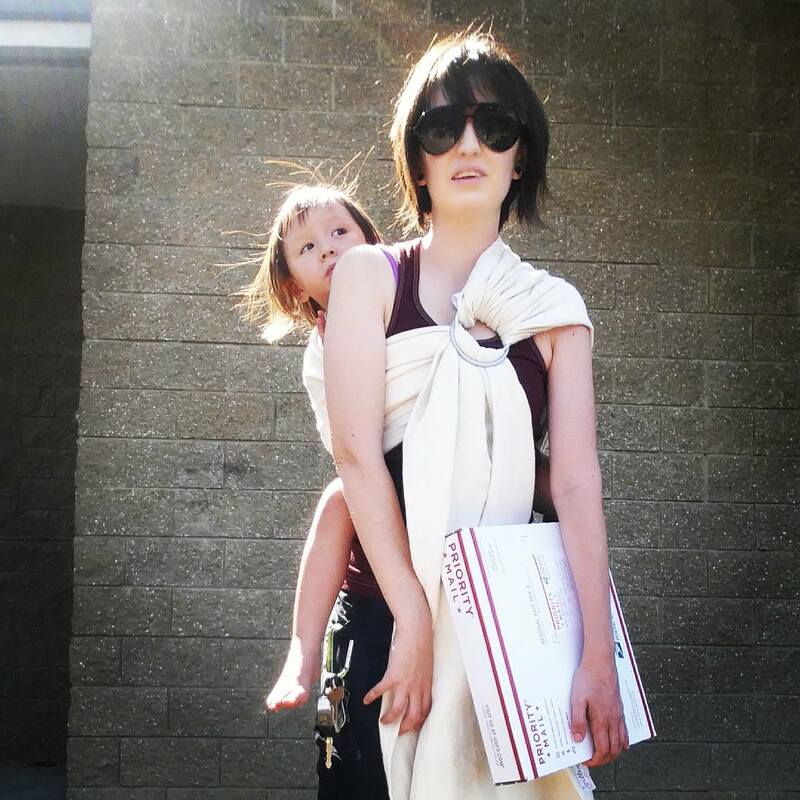 A ring sling with a 30 lb toddler is a whole other story though, let me tell you. This carrier rests comfortably in the “wide” category (27.5 inches across), which gave me more than enough width to get that knee-to-knee coverage with my daughter who is over 3 feet tall. I hadn’t noticed it was so wide when using it with my friends’ infant, so it surprised me when I measured it. The gathered shoulder made for some great weight distribution. The thickness and the texture made it fairly difficult to tighten with Dragon Baby already in the carrier, but once I wrestled her in to it – it was so nice on the shoulders. There was zero digging. I do prefer something a little more dense for such a giant kid though. 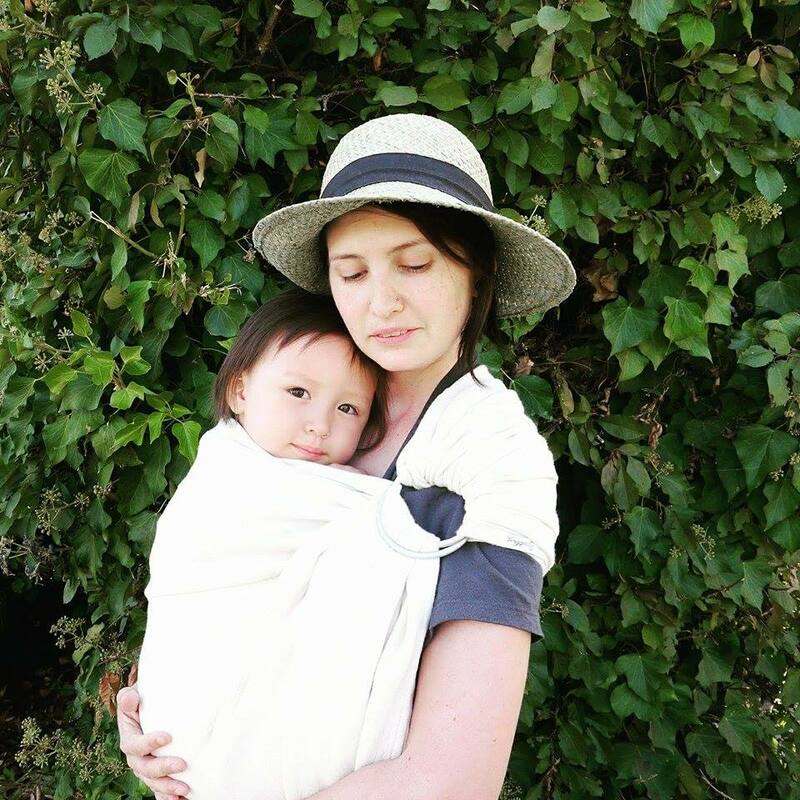 You kind of need something solid for a single pass carry with a preschooler, and this woven wrap conversion stretches for days. I think Crema would shine as an actual wrap with a big kid though, I can’t wait to try it out in that form. A few days later I tried it out in a back carry while I made my Post Office run. It was even more supportive in this carry! And the Dragon Baby loved the stretch in it, she was bouncing around back there and giggling. I started out with so much less slack in it this time, and it was much easier to adjust – even with my big toddler. Like their earlier releases, Smitten products are easy on the pocket book. It comes packaged in environmentally conscious packaging, including a used Children’s book that has been thoughtfully rescued from the landfill. This Ring Sling will run you about $100, and some of that money is going to be donated to Save A Child’s Heart – so you can feel good about supporting not just a wonderful company, but a wonderful cause with your purchase. This sling is so easy to maintain, too. You can throw this 100% cotton conversion in the washer (put some socks over the rings for your washer’s sake), and tumble dry on low. Even in loom state, Crema is so fluffy, but you will be shocked when you get it out of the drier that first time and see how much it fluffs up! She’s having a blast bouncing around back there. I would recommend this sling for anyone who is looking for an affordable, beautiful natty wrap conversion ring sling. The pattern is so subtle, it will match with anything, and you don’t have to fret over it getting dirty – because it is so easy to care for. The softness makes it a great newborn option, but it has the support for a cushy toddler carry too. The tester I have has gone through dozens of hands, and is always met with a WOW. There is nothing else like this on the market, and that in itself makes me so excited for this product. It is truly something unique. Congrats again to Smitten for another awesome release in the budget category. I applaud you guys for bringing all these lovely options into a more accessible price point, and for this innovative new addition to this category of Ring Sling.